Last week, Instagram released its year in review data for 2017 and today, Twitter is looking back at the year that is drawing to a close by publishing ‘Canada’s Year in Review 2017’, spotlighting the country’s most popular hashtags, the most followed athletes, politicians, entertainers and much more. 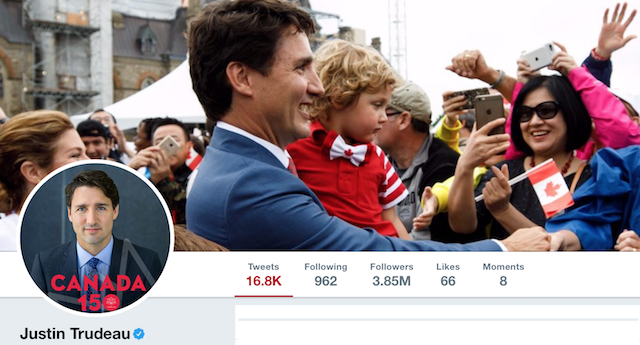 Prime Minister Justin Trudeau (@JustinTrudeau) was the most mentioned Canadian account in Twitter for 2017, followed by Toronto Blue Jays (@BlueJays), Montreal Canadiens (@CanadiensMTL), Globe and Mail (@globeandmail) and CBC (@CBCNews). The top 5 hashtags were #GoHabsGo2, #BellLetsTalk3, #cdnpoli4, #Toronto5 and #Canada150, with #Canada150 remaining the biggest topic on Twitter Canada all year long.